If you're a coffee lover in India then you'll definitely know about Cafe Coffee Day, but did you know you can make great savings at the chain and online with a wide range of discount deals? Here at DealSunny we have the largest and most up to date list of Cafe Coffee Day coupons on the web, so you never have to waste your time searching on Google for a valid coupon or deal again. Simply browse through the selection below and if you see an offer you like, clicking the link will open a new window with all the terms and details on how to redeem it. Now you can get luscious coffee and snacks without paying full price ever again! If coffee is not what you're after, then be sure to check out our full list of merchants, including online stores, service providers, and even food delivery apps. You can save money wherever you spend your cash, if you come to DealSunny first! 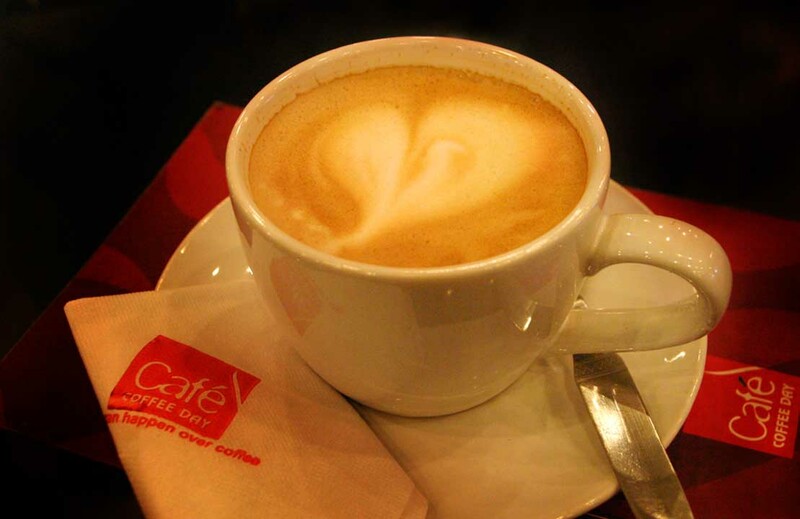 Cafe Coffee Day is one of India's largest chains of coffee shop, providing numerous types of fresh coffee, sandwiches and snacks from over 1,550 locations across the country. The company operates as a subsidiary of Coffee Day Enterprises and is based out of Coffee Day Square, Vittal Mallya Road, Bangalore, Karnataka, India. As well as its traditional chains in 29 states, the brand is also available online at CafeCoffeeDay.com, where customers can purchase coffee, coffee makers and merchandise for home delivery. One reason why customers appreciate the Cafe Coffee Day brand so much is their affordable pricing and wide range of special offers. These are commonly redeemed with Cafe Coffee Day coupons, both at location and for online purchases. We maintain a list of these right here at DealSunny, so remember to check back before visiting a chain or ordering online, to ensure you make great savings! Cafe Coffee Day was founded in 1996 as the retail arm of coffee grower Coffee Day Global Limited. Instead of just supplying the coffee industry, they decided money could be made by opening their own cafes that served fresh coffee and snacks. The first establishment was opened on July 11, 1996, at Brigade Road, Bangalore, Karnataka, and rapidly expanded thereafter. It is now a household name in India, much like Starbucks or Costa in the West. As well as its chain of coffee shops, the brand also markets their own coffee makers and pre-packed coffee at stores and supermarkets. They began selling these online from their own eCommerce store in 2011, now a top destination for online coffee lovers. Coffee Day Fresh 'n' Ground - Is their chain of retail stores where you can buy their beans and powder. Coffee Day Square - Is their small chain of luxury coffee bars in Bangalore, Chennai, Mumbai, and New Delhi. Coffee Day Xpress - Offers their basic coffee ranges from kiosks in malls and other locations. Coffee Day Beverages - Provides over 34,000 vending machines for instant coffee. Cafe Coffee Day makes upwards of 1,326 crore in yearly revenue, with over 5,000 permanent staff, and V.G. Siddhartha serving as Chairman. "Popularly known as CCD, we strive to provide the best experience to our guests. To put it plainly, we brought in the concept of cafes to India (this is where you thank us! )," reads their about page. 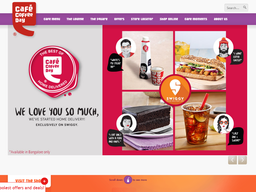 The online store of Cafe Coffee Day sells all of their retail coffee and products across India for prompt home delivery, as well as merchandise and gifts. This includes everything from cakes to coffee makers, and mugs to flowers. They cater to both individuals, bulk buyers and corporate customers. The online store can be accessed at Shop.CafeCofeeDay.com and via a mobile app for Android devices, from the Google Play Store. Before jumping in with a Cafe Coffee Day promo code, be sure to fully check our list of offers here at DealSunny to ensure you make the most savings possible. Some coupons may be applicable on any purchases, however others may offer deeper savings for specific products only. Click one you want to use to reveal the full terms. The Cafe Coffee Day coffee maker range includes Stovetop Espresso Machine (2 cups and 4 cups), French Presses, the Wakeup fully automatic brewer (orange or blue), and their patented Milk frother. Types of coffee available includes Regular Coffee Powder, Premium Coffee Powder, Coffee Capsules, and even your own Custom blend. There is also their Coffee On The Go and Coffee Premix brands, as well as their Single Origin blends. These include Costa Rican Tarrazu, Colombian Supremo, Ethiopian Sidamo, Guatemala Antigua, Mysore Nuggets Extra Bold, and Indian Kathlekhan Superior. As well as coffee they also sell three brands of Tea: Assam, Darjeeling, and Green Tea. Snacks available include Pure Indian Indulgence Cake, Hazelnut Karat Celebration Cake, Cookies, Butterscotch Bars, Mints, Chocolate Bars, Chocolate Boxes, Sweets, and more. You can also buy Cups, Saucers, Sippers, a Cafe Coffee Day notepad, and even Bouquets of Flowers. Cafe Coffee Day also sell a range of "Smuffin" bandanas and face masks aimed at teens and children. Some of the current bestsellers online include the Ceramic Espresso Mug, Mighty Mason Sipper, Joie Hazelnut Bar, Double Chocolate Chip Cookies, Roosh Cup & Saucer, Pure Arabica Coffee Capsules, and many others. Looking to buy a coffee lover a gift, but aren't sure what they'd like? The store offers special gift vouchers between Rs. 250 and Rs. 1,000, which will allow the recipient to make their own choices when they redeem it. Combo Offers: Buy select products altogether and they will become a combo, giving you a discount over buying each item separately. Regular Sales: From time to time the store will discount certain items for a set period of time. All you have to do is add these to your basket as normal to benefit from the savings, but be sure to do it quickly in case the sale ends soon. Cafe Coffee Day Coupons: These are special codes that you must enter on the website during checkout, which will apply the coupon's associated offer. This may be a discount or some other deal. Printable coupons can also be used at one of the cafes by handing it to the waitress or cashier. App Exclusives: If you download the mobile app for Android devices you will be treated to exclusive offers from time to time. So if you have such a device, there's no reason not to install the app. As well as bookmarking this page to stay up to date with offers, you can also find some exclusives by signing up to their email newsletter with your Name, City and email address. This will include online and cafe deals. You might also find some exclusives by following them on social media. They have active accounts on Facebook, Pinterest, Twitter, Youtube, and Instagram. Their Youtube features commercials, product overviews and footage from inside their cafes and other chains. Cafe Coffee Day currently only accepts online payment methods for online purchases, with no Cash On Delivery option. Any common Credit, Debit or Cash Card can be used, including Visa, Visa Debit, American Express, and Diners Club. You can also use Net Banking with most major Indian banks. If you have been gifted a gift card you can apply the balance to all or a portion of your order, with any remaining bill covered by a card or net banking. You also do not have to use all of your gift card balance at once. Just before choosing your payment method you will see a promotional code box. This is where you can enter any Cafe Coffee Day coupons from DealSunny or elsewhere, to redeem their corresponding offer. If valid and entered correctly there will be a confirmation message and your order will update according to the terms of the offer. For example Cafe Coffee Day discount coupons will make the cost of your order will drop. Note that only one coupon can be used per order, so make sure you choose the one that will make you the best savings! Cafe Coffee Day does their best to serve all addresses in India. This includes individual home addresses, as well as corporate and bulk order addresses as well. However some locations may be deemed too remote, so you are encouraged to enter your pin code on the product page to check availability. They will use the most convenient courier for your region. The majority of orders are delivered within 7 working days. There is no charge for shipping and you do not have to find a Cafe Coffee Day promo code to claim this. It is automatically applied to every order. You will be informed by email when your order is dispatched and on its way. If you have shopped online before you should have no trouble placing an order on the Cafe Coffee Day web store. They use a regular digital basket and checkout system, and industry standard secure gateways for paying via card or net banking. Before you can complete an order you will however have to register and account by providing your email address and other personal details. This will allow you to overview your order, payment methods and make purchases quicker in the future. To find what you want simple browse the appropriate categories or use the search bar at the top of the page. Helpful user ratings and reviews give you an idea of what's good and not so good, and the product pages feature photos, a description and other relevant details. If happy you can add the item to your cart and redeem any Cafe Coffee Day offers via coupon, by entering the code in to the box. The Cafe Coffee Day app is available for Android devices only, from the Google Play store. There it has a high star rating of 4 starts out of 5, from over 3,400 users. While you cannot purchase products from the online store using the app, you can keep up to date with Cafe Coffee Day offers and discount coupons, find your nearest cafe, top up your mobile payment wallet, and refer friends. If you refer a friend who then uses the app in the cafe to make a purchase, you will be rewarded with points that can be redeemed for future discounts. Other unique app deals include 10% cashback, which they call "Beans." The Cafe Coffee Day app has been installed by hundreds of thousands of Android users. To do so you will need version 4.1 or higher and 8.1mb of free space. You are free to return any unopened, brand new and resaleable item for a refund. Simply contact customer support on 1860 500 4422 or email at [email protected] You should also contact customer support if your order is damaged or defective, and you can opt for a replacement or refund. In the case of an unwanted but unused item you will be issued store credit. In the case of a damaged item you will receive a refund to the payment method used. It can take up to 10 working days for this to fully process with some banks and card issuers. If you used a gift card, your gift card balance will be replenished. Obviously if you have used any Cafe Coffee Day coupons to get a discount, you will only be refunded the actual amount you paid in cash terms. The online Cafe Coffee Day store is a professionally made website that takes user security very seriously. They use industry standard encryption to protect your data, and the thawte secure payment gateway to process card and net banking payments safely. They vow to never pass on or sell your personal details to third parties without your permission. How Do I Redeem Cafe Coffee Day Coupons and Offers? Regular offers such as sales or combos do not require you to do anything special to redeem, however coupon codes either must be entered in to the designated box at the online store, or physical coupons handed in at the cafe. @sahil_tanwar Hi there. We are sorry for the inconvenience caused. Your feedback has been noted and we will get in touch with you soon.